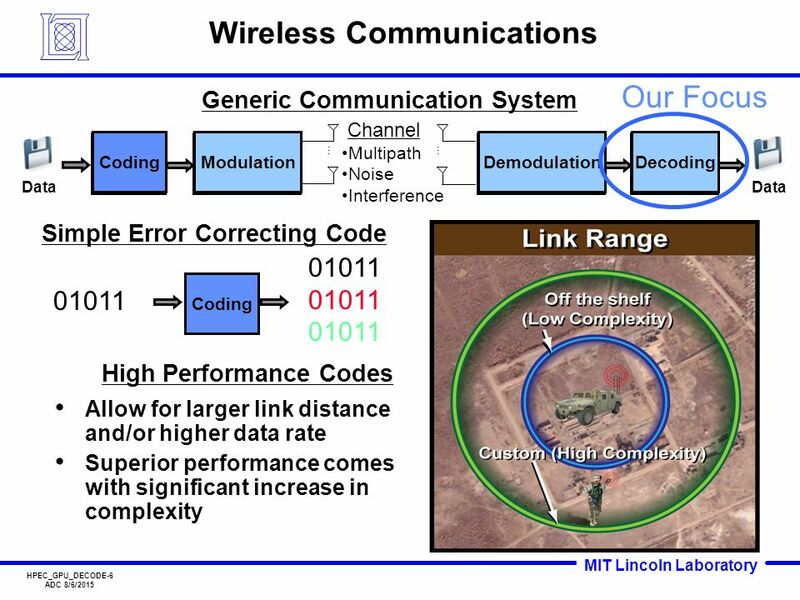 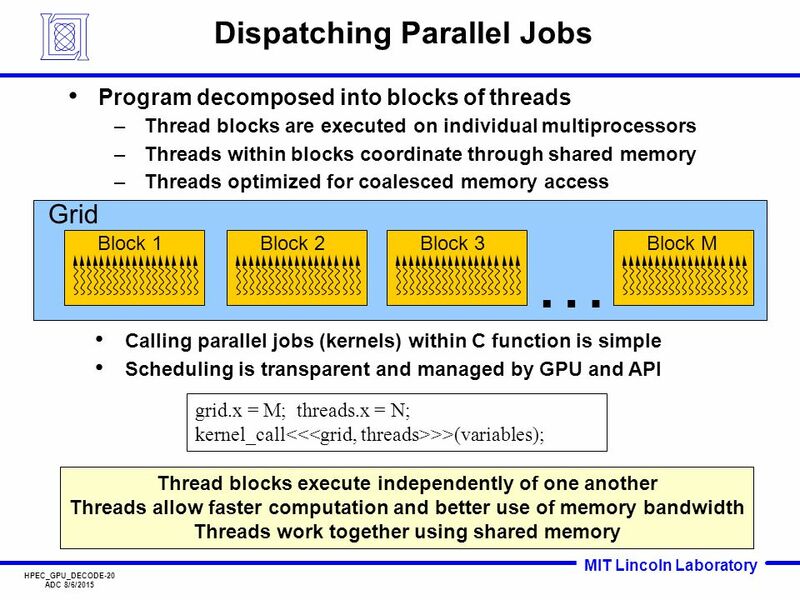 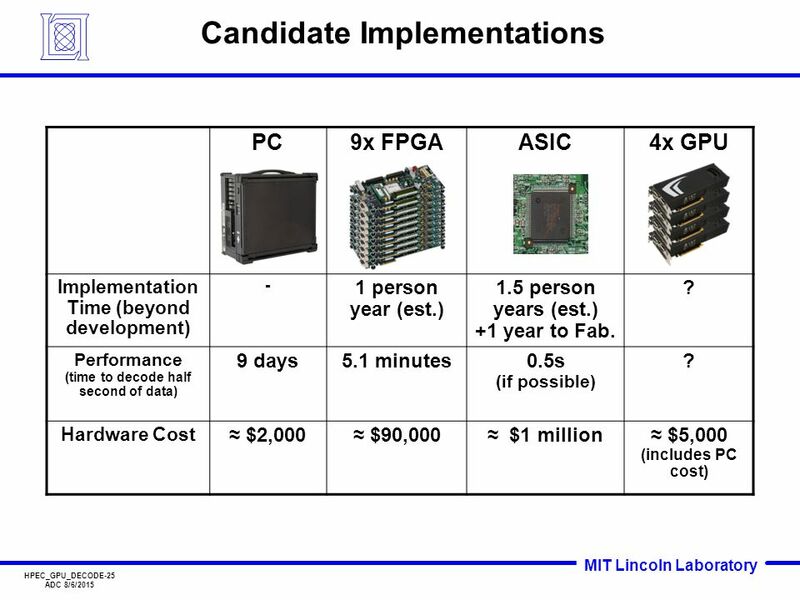 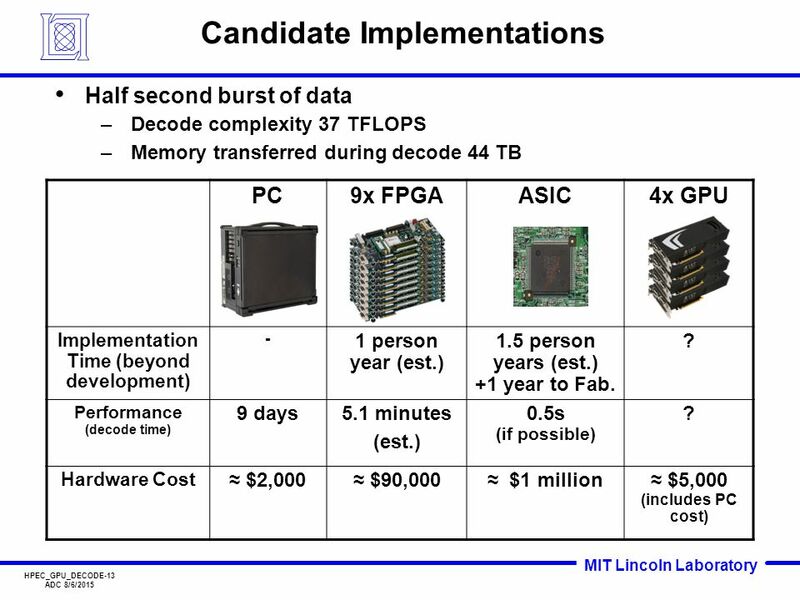 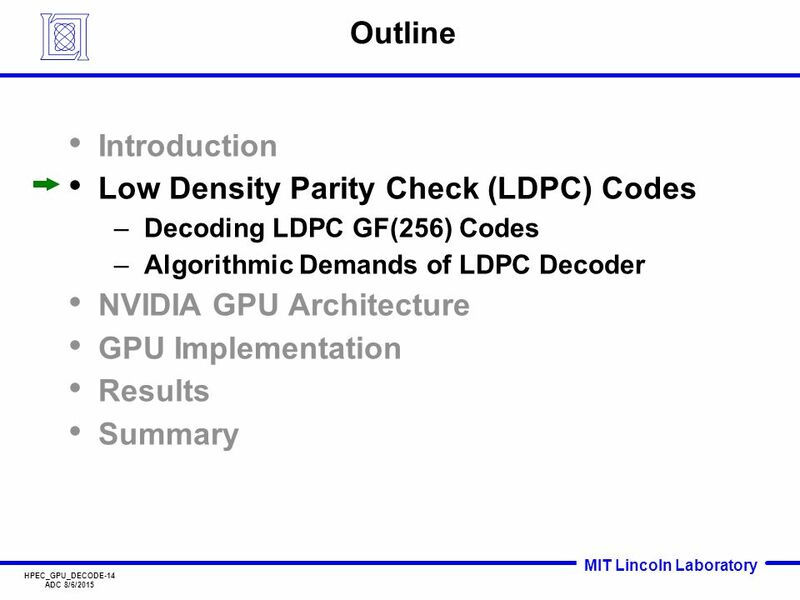 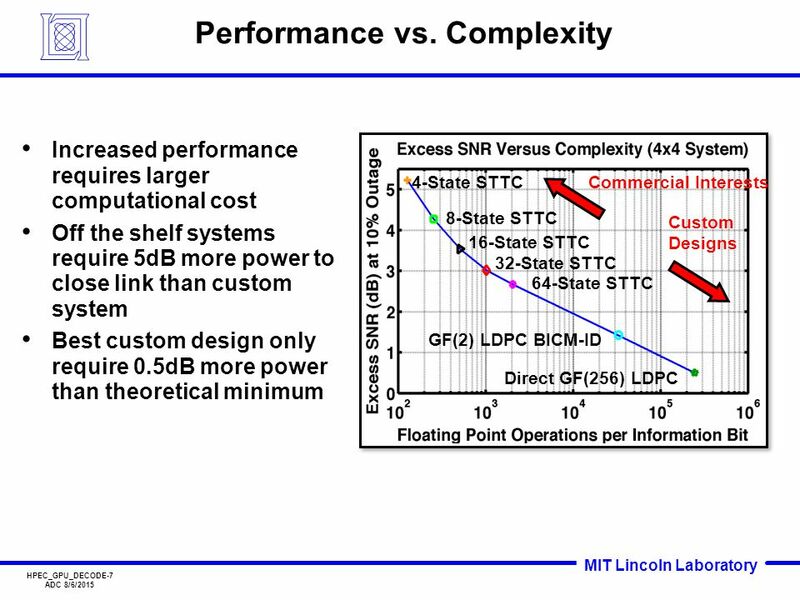 HPEC_GPU_DECODE-1 ADC 8/6/2015 MIT Lincoln Laboratory GPU Accelerated Decoding of High Performance Error Correcting Codes Andrew D. Copeland, Nicholas. 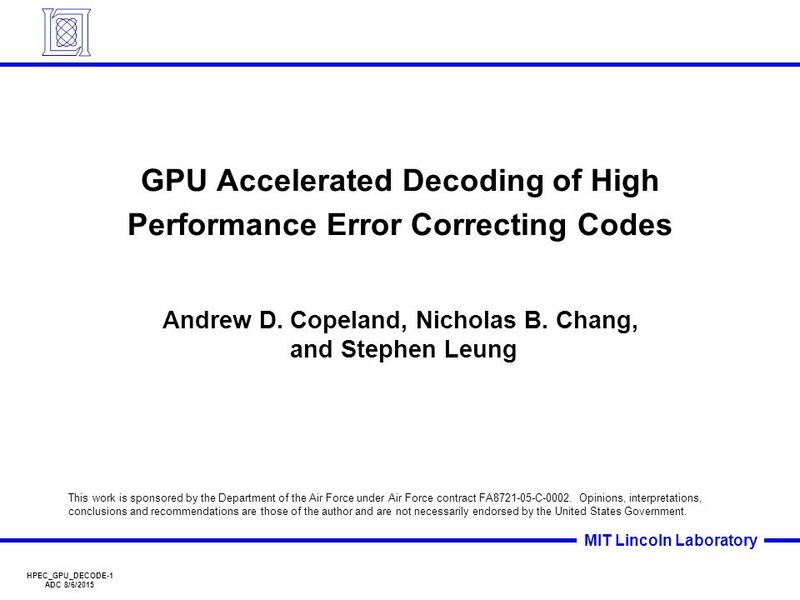 1 HPEC_GPU_DECODE-1 ADC 8/6/2015 MIT Lincoln Laboratory GPU Accelerated Decoding of High Performance Error Correcting Codes Andrew D. Copeland, Nicholas B. Chang, and Stephen Leung This work is sponsored by the Department of the Air Force under Air Force contract FA8721-05-C-0002. 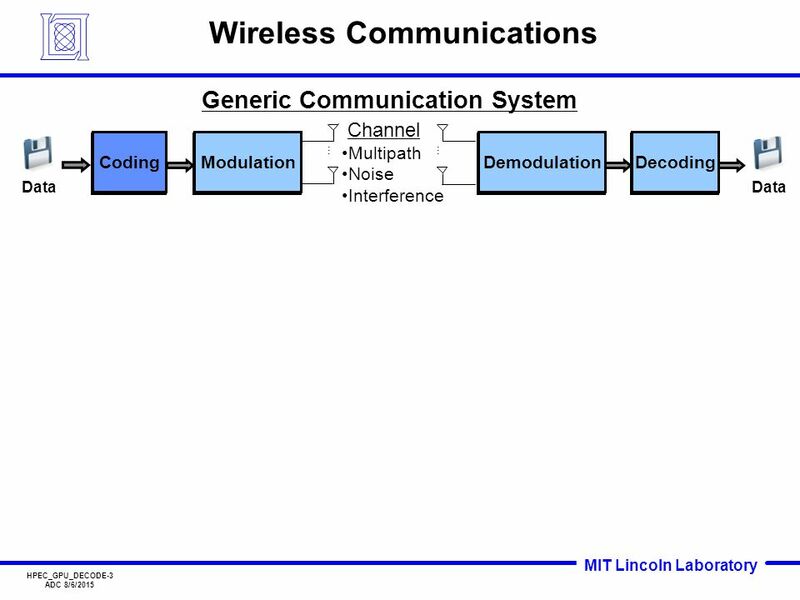 Opinions, interpretations, conclusions and recommendations are those of the author and are not necessarily endorsed by the United States Government. 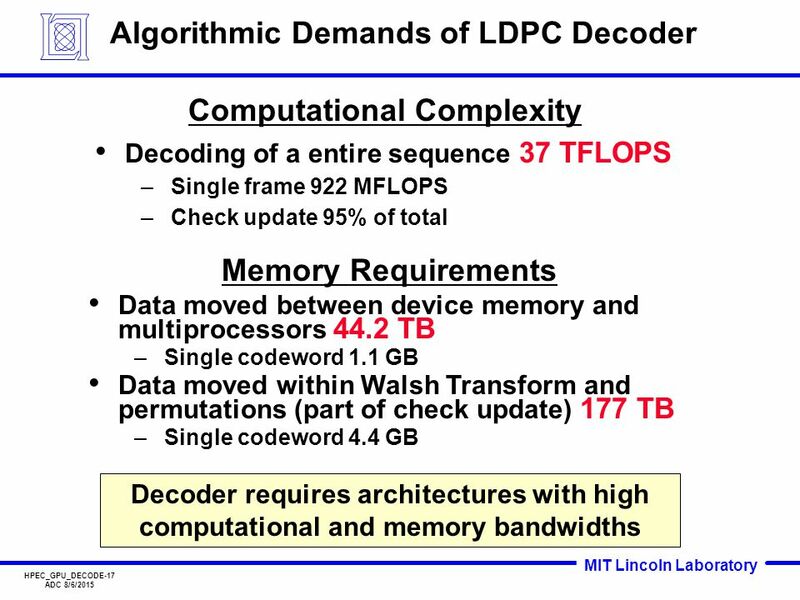 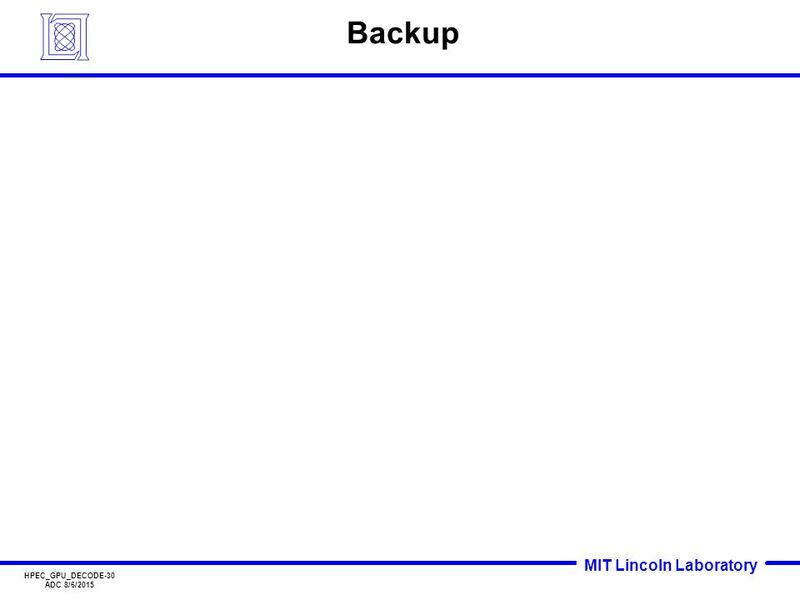 Download ppt "HPEC_GPU_DECODE-1 ADC 8/6/2015 MIT Lincoln Laboratory GPU Accelerated Decoding of High Performance Error Correcting Codes Andrew D. Copeland, Nicholas." (speaker) Fedor Groshev Vladimir Potapov Victor Zyablov IITP RAS, Moscow. 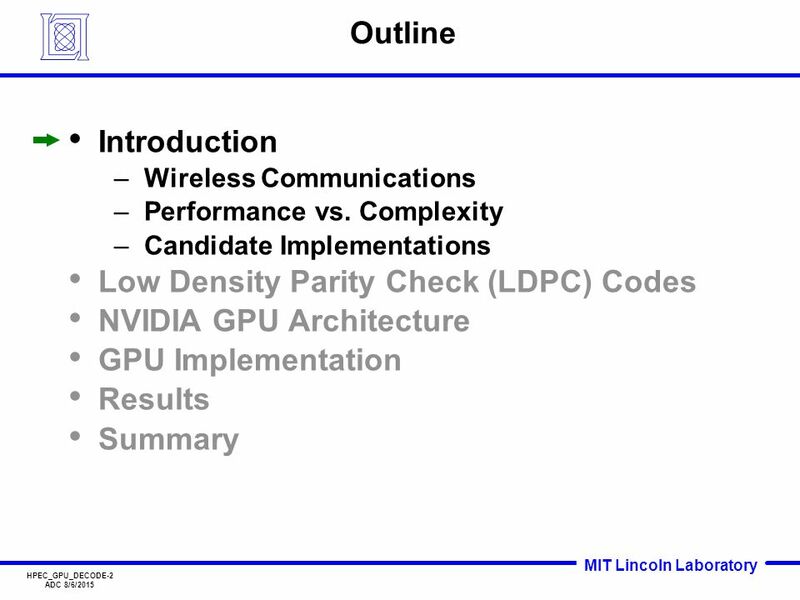 Exploiting Graphics Processors for High- performance IP Lookup in Software Routers Author: Jin Zhao, Xinya Zhang, Xin Wang, Yangdong Deng, Xiaoming Fu. 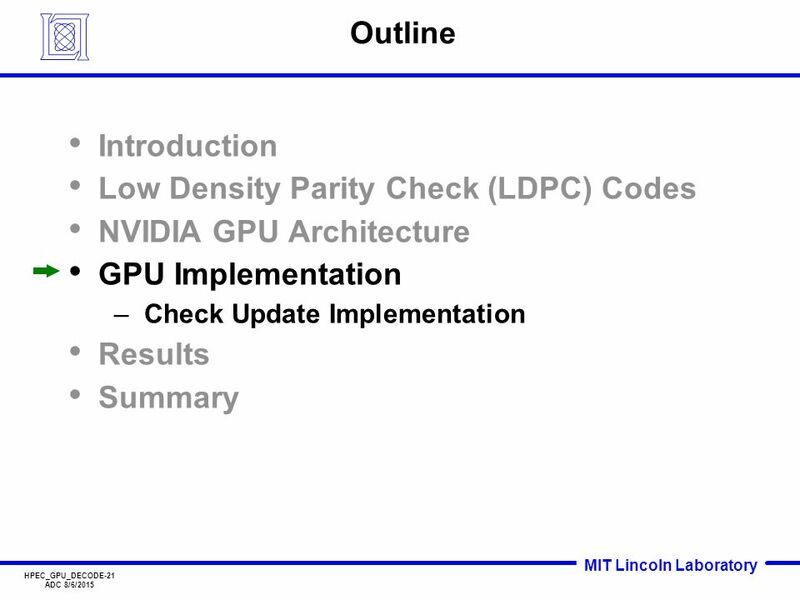 GPGPU Introduction Alan Gray EPCC The University of Edinburgh. 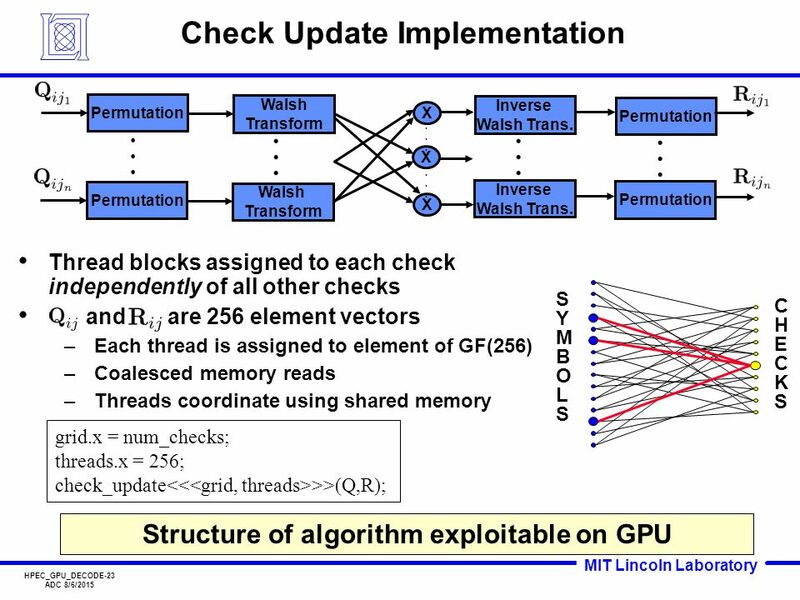 An Effective GPU Implementation of Breadth-First Search Lijuan Luo, Martin Wong and Wen-mei Hwu Department of Electrical and Computer Engineering, UIUC. 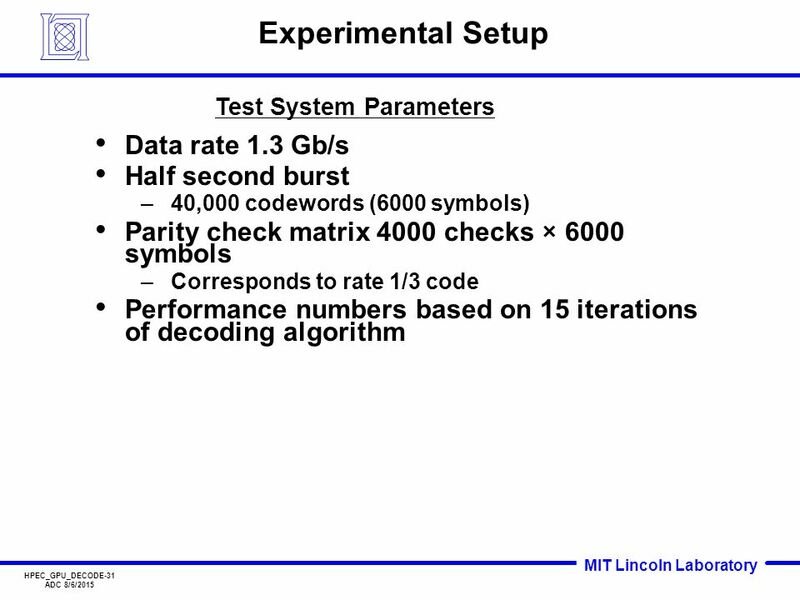 Improving BER Performance of LDPC Codes Based on Intermediate Decoding Results Esa Alghonaim, M. Adnan Landolsi, Aiman El-Maleh King Fahd University of. 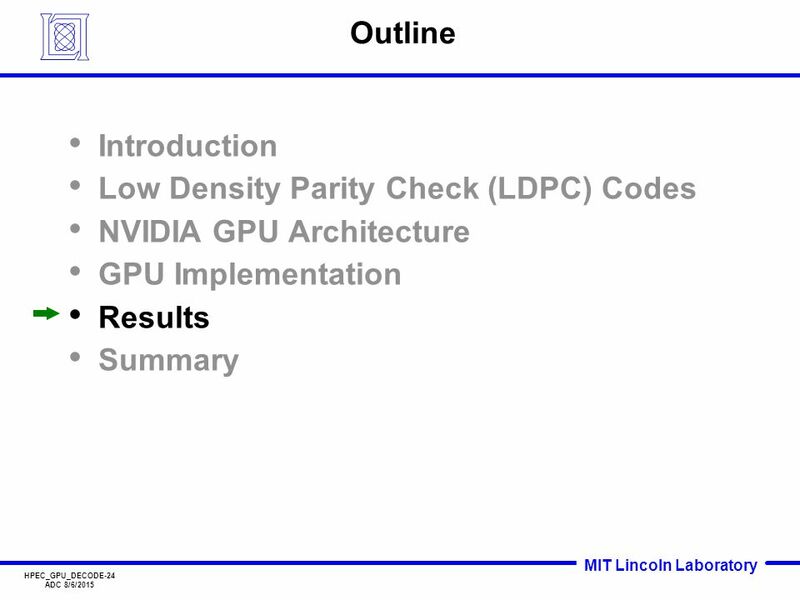 K-means clustering –An unsupervised and iterative clustering algorithm –Clusters N observations into K clusters –Observations assigned to cluster with. 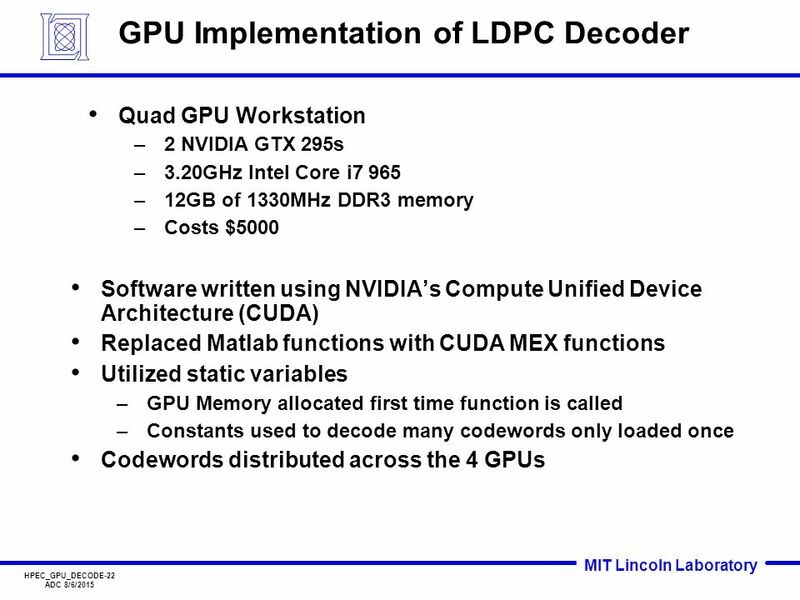 Fast Circuit Simulation on Graphics Processing Units Kanupriya Gulati † John F. Croix ‡ Sunil P. Khatri † Rahm Shastry ‡ † Texas A&M University, College. 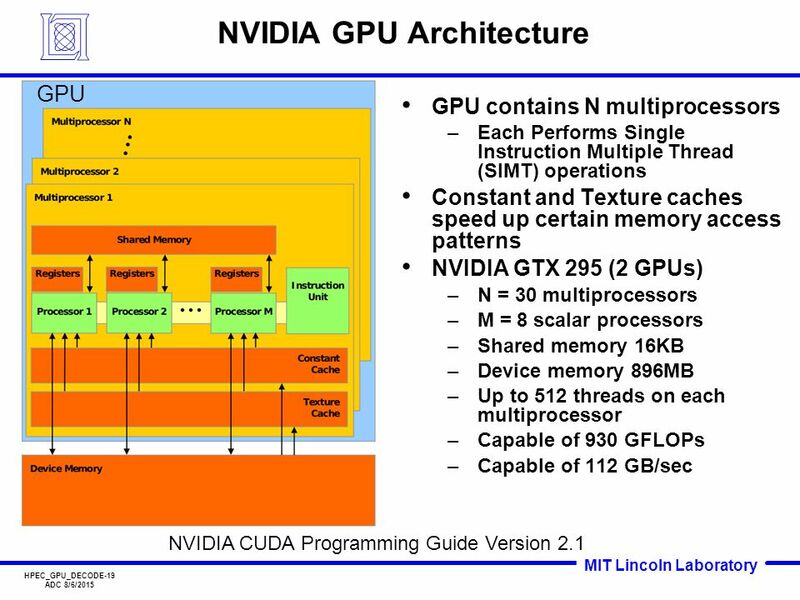 GPUs. 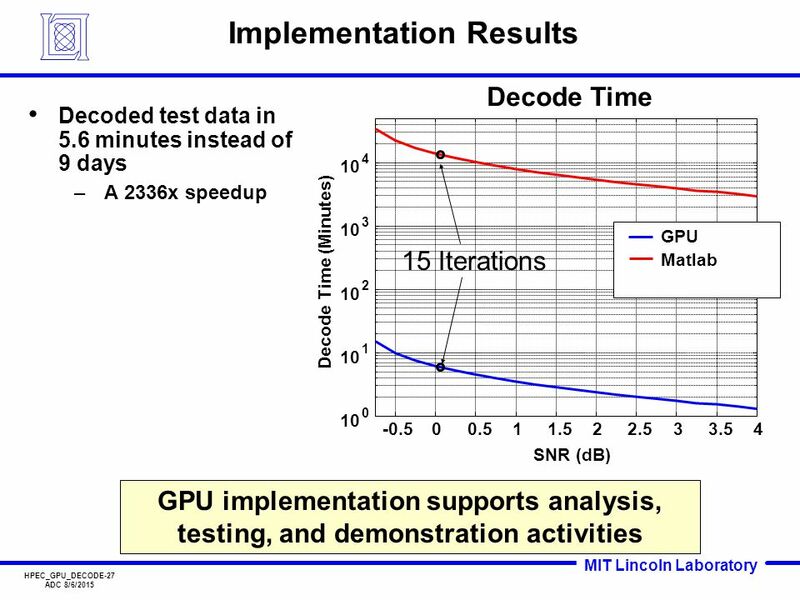 An enlarging peak performance advantage: –Calculation: 1 TFLOPS vs. 100 GFLOPS –Memory Bandwidth: GB/s vs GB/s –GPU in every PC and. 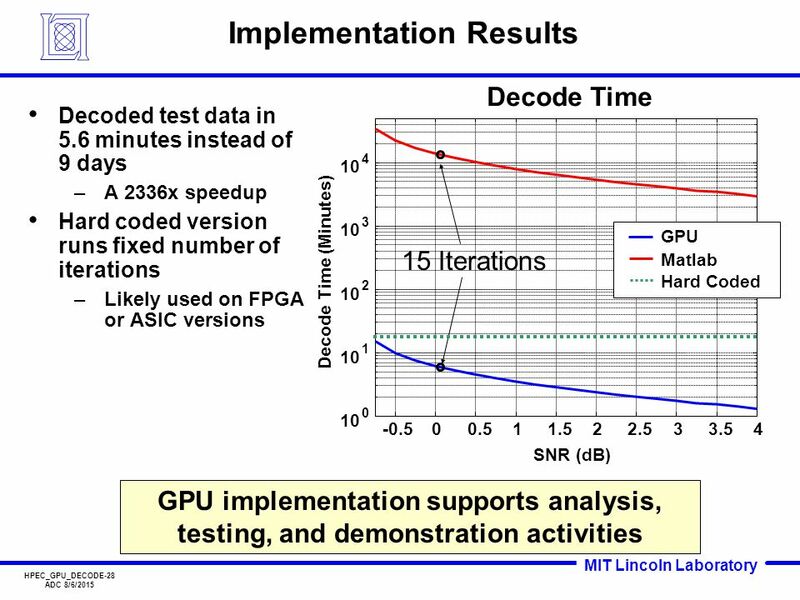 Towards Acceleration of Fault Simulation Using Graphics Processing Units Kanupriya Gulati Sunil P. Khatri Department of ECE Texas A&M University, College. 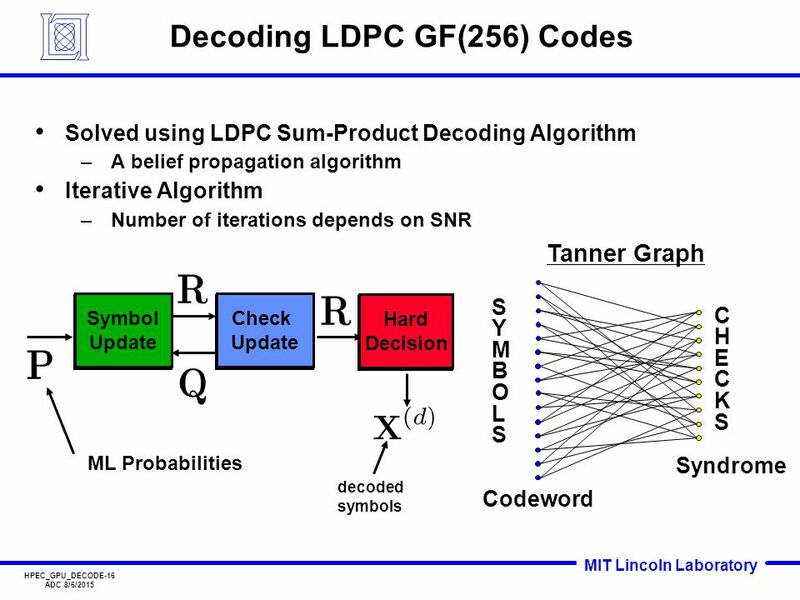 L15: Review for Midterm. 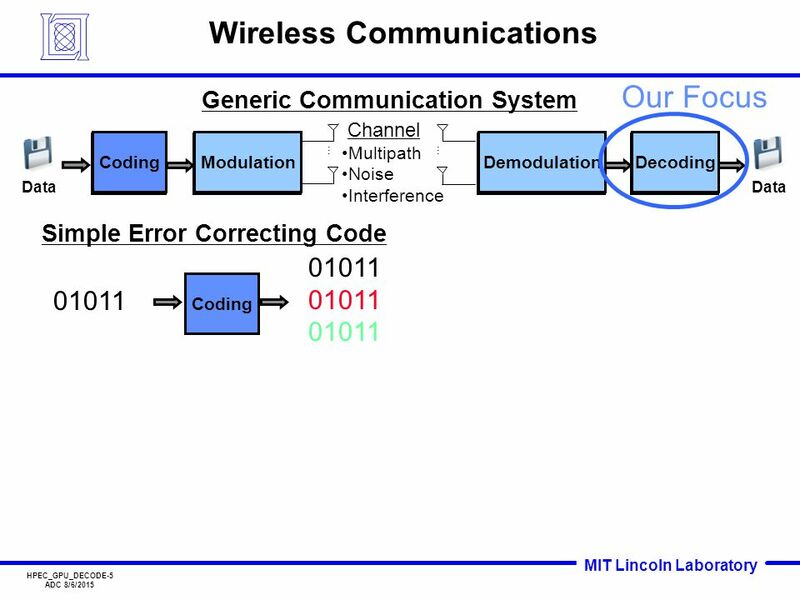 Administrative Project proposals due today at 5PM (hard deadline) – handin cs6963 prop March 31, MIDTERM in class L15: Review. Name: Kaiyong Zhao Supervisor: Dr. X. 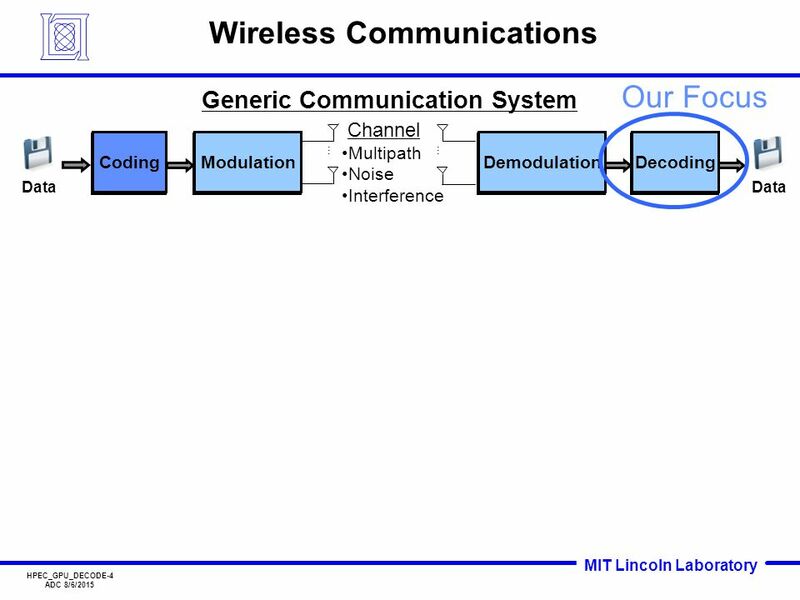 -W Chu. 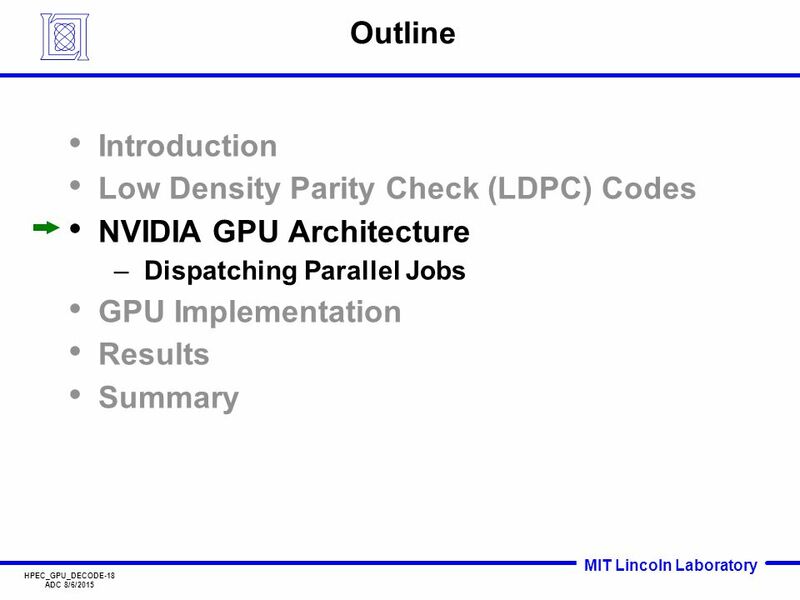 Background & Related Work Multiple-Precision Integer GPU Computing & CUDA Multiple-Precision Arithmetic. 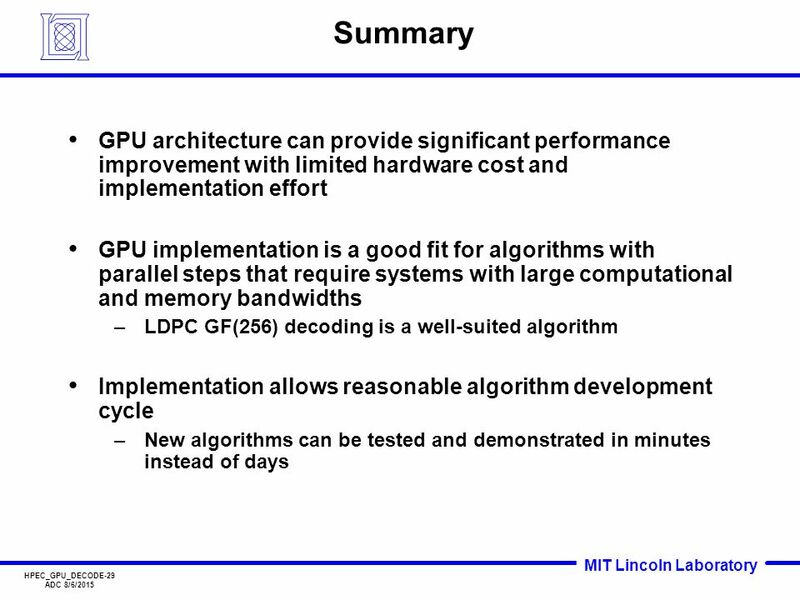 Accelerating Machine Learning Applications on Graphics Processors Narayanan Sundaram and Bryan Catanzaro Presented by Narayanan Sundaram. 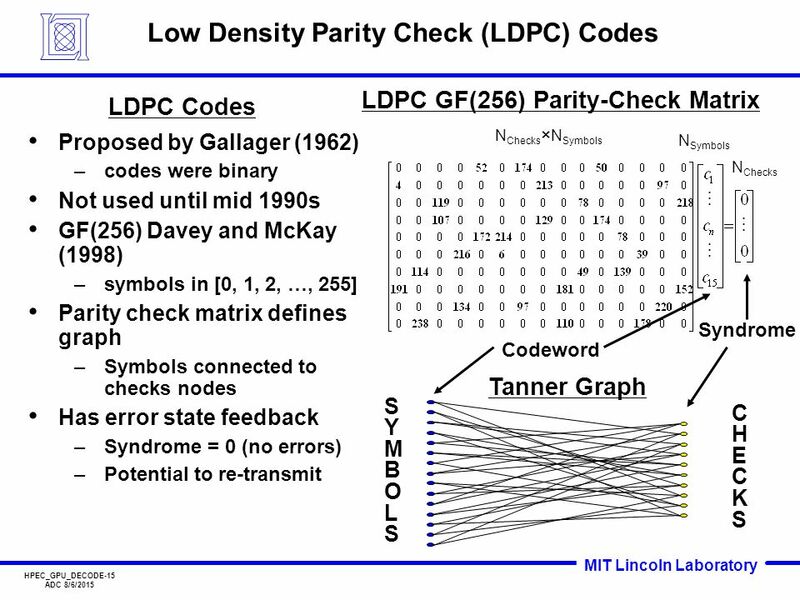 Introduction of Low Density Parity Check Codes Mong-kai Ku.